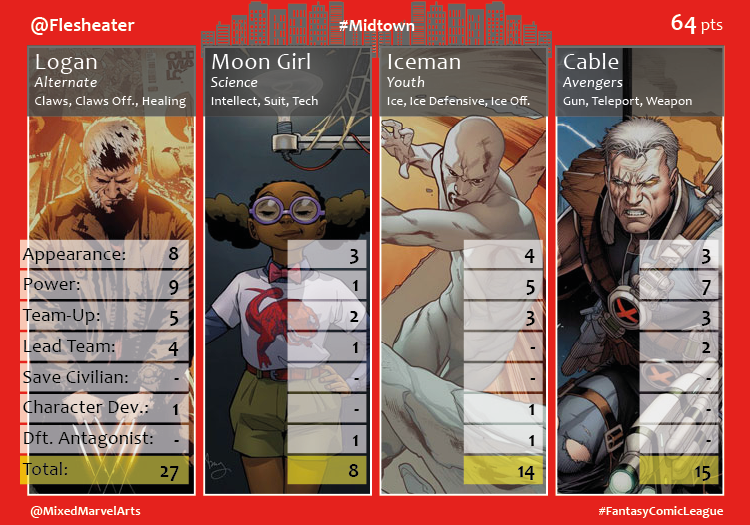 The Midtown Fantasy Comic League agents successfully swept the streets of New York clean for the final month of the year. 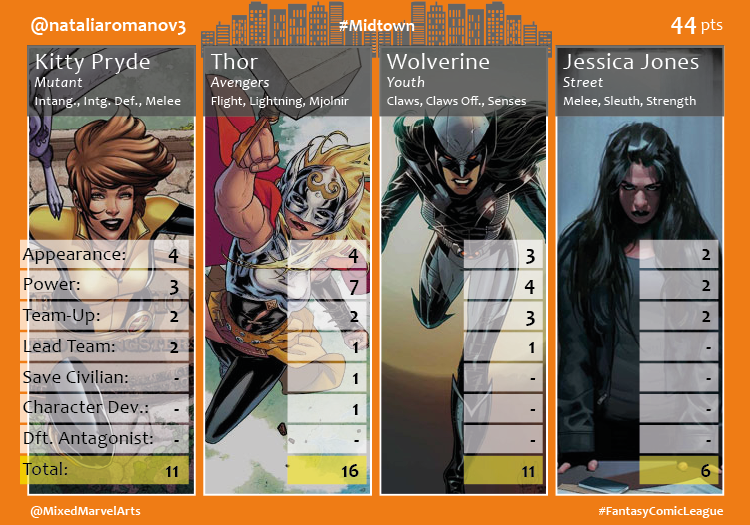 Midtown reported in as the top performing division once again with 293 points and all five agents caught in a close battle to decide the winning participant. 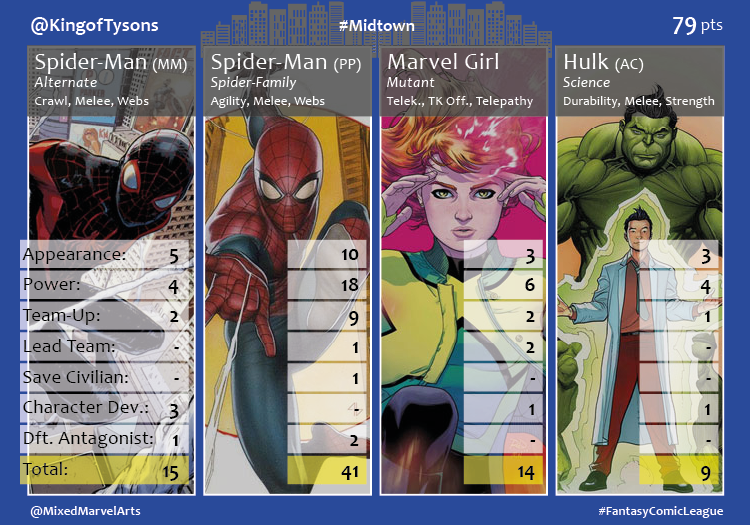 The Midtown #FantasyComicLeague heroes took the lead in battle 22 times and had 14 instances of character growth. Ultimately, it was not too hard to secure the division when there were only six antagonists to defeat and two civilians to be saved. In the end, Agent @KingofTysons recovered from his third-place finish in the previous month to lead the division for the duration of December. His tag-team Spider-Man crew scored him 79 points with Peter Parker’s 41-point performance balancing out Hulk’s 9-point subpar finish. Agent @Flesheater took his third consecutive second-place finish. Cable, a hero who typically sank other teams in the past, finally had a decent performance of 15 points. He supported Logan, Flesh’s top hero, who scored 27 points for the month to give Flesh a64-point finish. 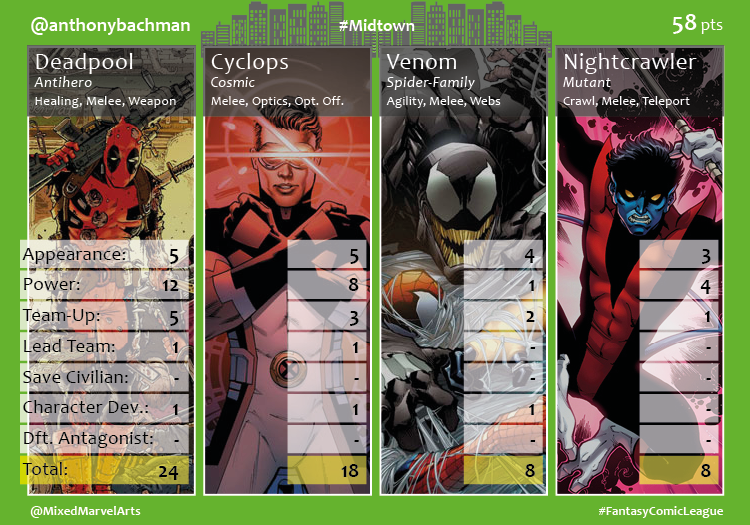 Venom failed to make a strong impression for Agent @anthonybachman during the start of his new event and team-up with the Amazing Spider-Man in “Venom, Inc,” but Deadpool and Cyclops, the third and fourth-best performing heroes for the month, gave Bachman a third-place finish with 58 points. 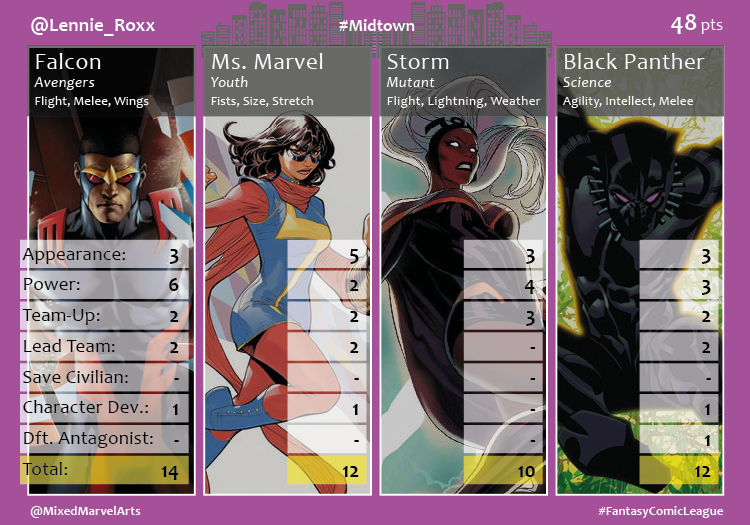 Agent @Lennie_Roxx‘s steady quartet of heroes – Falcon, Ms. Marvel, Storm and Black Panther – averaged 12 points for her team and gave her fourth place with 48 points. Agent @nataliaromanov3 fell victim to the first-place curse and watched as several of her regular heroes were drafted by other agents. She went back to the well for Jessica Jones, who unfortunately had the lowest-scoring performance of the month with six points, and finished in last place with a score of 44. Congratulations to all agents on another hard-fought battle to keep the peace in the streets of Midtown for one more season!